While pulleys can be manufactured out of any number of materials, including steel, aluminum, or die cast, nylon pulleys offer a wide range of advantages over their metal counterparts. 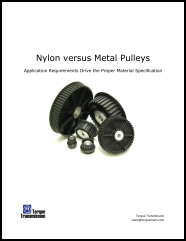 One of the most important advantages of nylon is that nearly any design requirement can be met! Please complete the short form to download the whitepaper.